If you would walk down towards the treeline from my parent’s front door, you’d stumble upon a shed, obscured from sight by some bushes and trees. In that shed you would find an assortment of chainsaws, bushcutters, wood splitters, and other machinery. If you would look past the small go-kart like mower (with the chunky tires for tackling mud and what not) roughly in between the vintage and the new tractor, you might notice a gray tarp. Now let’s imagine you could easily make your way over there, and pulled the tarp off, you’d be looking at one of the most beautiful cars ever build. At least, to me it is. In that shed hides a 1972 Mercedes 450SL. With the original sealbeam lights, and the rare banana shaped indicators. The massive hood harbours a 4,5 liter V8, and it has a hardtop that is removable, for those sunny summer days. You might wonder how in the hell such a car ends up in a place like that. It started its life in Germany, where it was built. Then it was shipped to be sold on the American market, hence the banana shaped indicators. Only fitted to American models build between ’72 and ’74 (according to a Mercedes mechanic). I don’t know how it found its way back across the Atlantic to the Netherlands, but it evidently did. There it was eventually purchased by my father, because his younger brother recommended it would be a good investment. 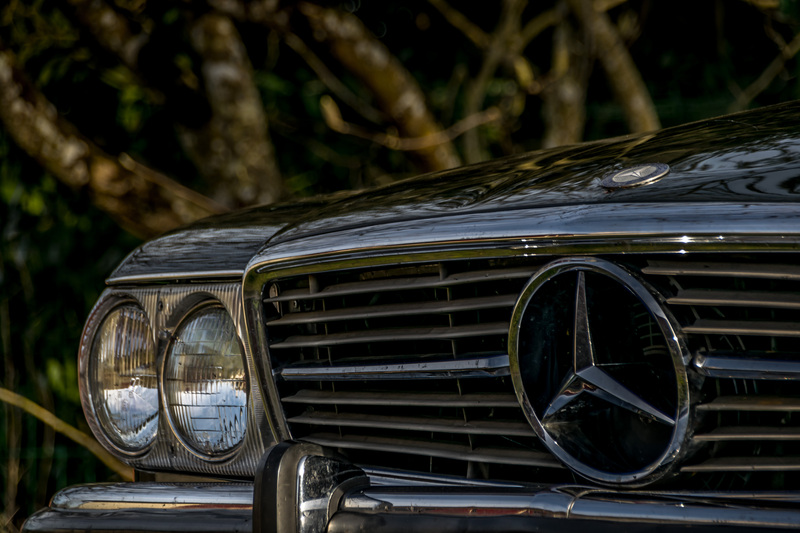 Then, when my parents moved to France, so did the Mercedes. Now it (sadly) spends it days slowly succumbing to time, its brakes seizing up, fuel lines cracking and leaking, and paint bursting open under the influence of temperature changes. Being surrounded by rugged forest equipment isn’t doing it much good either, evidenced by the small accumulation of dents dotting the bodywork. Every time I visit my parents though, I dig through that shed and get her out for a bit. A wash, a wax and the needed TLC. Then, if I’m assured that she is reminded that someone has not forgotten her, and she isn’t acting up, I take her for a drive. After a few corners, or a few idiotic Frenchmen who just swerve into the oncoming lane for no apparent reason, the brakes have shed their layer of rust, and although the left side outperforms the right, at least they can still bring you to a stop whenever you want. This year the temperature gauge seized up, only to spring back to life as soon as I pulled back into the driveway. So the next day, with a good indication of how hot the engine was, I was able to go for a longer drive. Despite all the things that are broken, or at least need attention, the car still turns heads where ever you go. Of course the heavy grumble of a V8, born in an era when petrol was plentiful and no one had even heard of global warming, draws its fair share of attention too. The German engineers who worked on these cars used to call it “The armoured car” because it was so sturdy and reliable. But this armoured car would need a lot of engineering to be brought back to factory standard. The entire interior is shot, with ripped leather and frayed fabrics. All the wiring needs to be checked, and mostly replaced, judging by all the failing dashboard lights and other failing electronic components. The engine itself could do with a refurbishment, and the body needs repair work too. Thankfully no rust, but dents a plenty, and like I mentioned before, cracks in the paint that run as deep as the primer. So here comes the shocker; I’m thinking about importing this car to Australia. Besides the fact that it actually is a rare model, it is mostly because the fact that I simply love that car. As a young boy I would sometimes sneak into the garage, just to sit in it. I even got my first kiss in the passenger seat, after sneaking into the garage to show a girl the car. Then, when I got my license, I sometimes secretly went for a drive in it. Getting busted one time because I forgot the radio didn’t shut off when you shut off the engine. I didn’t get in trouble though. Then, when my parents moved to France, me and a friend drove her there. Almost reaching 200km/h on the last abandoned stretch of freeway before we had to go onto the rural back roads. I don’t plan on taking much of my stuff with me, but such a living testament of my childhood should not be left behind. Sadly my dad would rather sell it, and I, although willing to pay for the import (and subsequent quarantine and tax costs in Australia) have no intention of paying a dime for the car. He must think it just takes up space, and always remarks on how I’m the only one that tries to take care of it. Besides, in its current state it is hardly worth $3000,- I’d reckon, so I wish him good luck on selling the car for his asking price. If he succeeds though, I’ll look for another old-timer in Australia, but I would rather drive this one down the West Australian coast. Then pass it on to my kids (if I and Emma have any of course). I would hate to see that car go to waste in the back of some shed, instead of cruising the open road. During my last trip, one of the banana blinkers gave out. Thankfully it was just the bulb that gave up, and it was an easy fix. Like I said before, sometimes all it takes is some TLC. You look after your car and the car will look after you. That reminds me of driving through Luxembourg in a snow storm, seeing 18 ton trucks slipping down the hills past me. Cursing under my breath, I promised my car (then a Peugeot 108 Allure) that if she would get me home safe, I would do the same for her.